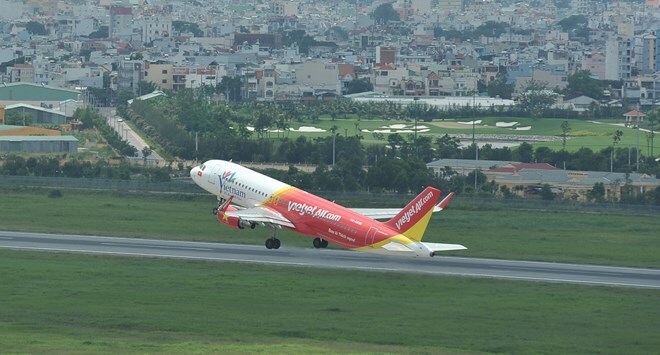 HCM City (VNA) - To welcome the most exciting travel season of the year, Vietjet Air will launch a five-day promotion from August 9-13, 2017 within 12:00–14:00 offering 200,000 super-promotional air tickets priced only from 0 USD. The promotion is applied for all Vietjet’s international routes from Ho Chi Minh City, Hanoi, Da Nang, Hai Phong (Vietnam) to Seoul, Busan (the Republic of Korea) / Hong Kong / Kaohsiung, Taipei, Tainan, Taichung (Taiwan) / Singapore / Bangkok (Thailand) / Kuala Lumpur (Malaysia) / Yangon (Myanmar) / Siem Reap (Cambodia) with flight time being from September 1, 2017 to May 31, 2018. The promotional tickets are available for booking within the golden hours from 12:00 to 14:00 (GMT 7) at www.vietjetair.com (also compatible with smartphones at https://m.vietjetair.com) or at www.facebook.com/vietjetvietnam (just click the “Booking” tab). Payment can be easily made with debit and credit cards of Visa, MasterCard, JCB, KCP and American Express and ATM cards issued by 29 Vietnamese banks that have been registered with internet banking. Besides, Vietjet continues to increase flight frequency for many international routes. Accordingly, the Ho Chi Minh City-Seoul route will have 14 return flights a week from October 29, 2017, increasing from previous 7 return flights/week. The Da Nang-Seoul route will be also increased from the 7 return flights to 14 ones per week from November 6, 2017. The Ho Chi Minh City-Seoul route will be operated with 2 return flights/day from October 29, 2017. The Ho Chi Minh City-Seoul flights depart from Ho Chi Minh City at 2:40 and 22:15 (local time) and arrive in Seoul at 9:50 and 5:25 (local time) respectively. The return flights take off from Seoul at 10:50 and 6:45 (local time) and land in Ho Chi Minh City at 14:20 and 10:15 respectively. The Da Nang-Seoul route will be operated with 2 return flights/day from November 6, 2017. The Da Nang-Seoul flights depart from Da Nang at 22:55 and 23:55 (local time) and arrive in Seoul at 5:00 and 6:00 (local time) respectively. The return flights take off from Seoul at 6:15 and 6:45 (local time) and land in Da Nang at 9:20 and 9:50 respectively. The transitioning weather is always favored by tourists to travel. This is also the best time for everyone to show care to their beloved ones by traveling to international destinations thanks to its cool weather. With its high-quality services, special low-fare tickets and diverse ticket classes, Vietjet offers its passengers enjoyable flights with dynamic and friendly flight crew, comfy seats, amazing hot meals, special surprises from the airline’s inflight activities and amazing ticket fares through “12pm, It’s time to Vietjet” promotion.